The Regional Office Program issues water/wastewater permits (WW Permits) for soil based wastewater systems with flows of less than 6500 gallons per day, for potable water supplies (water supplies that are not public water supplies), and for municipal water and sewer connections. Permitting staff are located in five Regional Offices. Staff also administers the licensed designer program and reviews innovative and alternative systems for potential use in VT. The regional offices map provides office, program and contact information for each region. This is a simplified overview of how a septic system works. Water runs out of your house from one main drainage pipe into a septic tank. The septic tank is a buried, water-tight container usually made of concrete, fiberglass or polyethylene. Its job is to hold the wastewater long enough to allow solids to settle down to the bottom (forming sludge), while the oil and grease floats to the top (as scum). Compartments and a T-shaped outlet prevent the sludge and scum from leaving the tank and traveling into the drainfield area. The liquid wastewater then exits the tank into the drainfield. If the drainfield is overloaded with too much liquid, it will flood, causing sewage to flow to the ground surface or create backups in toilets and sinks. Finally, the wastewater percolates into the soil, naturally removing harmful bacteria, viruses and nutrients. Flushing Do’s and Don’t Images: Is your septic system abused by guests or customers? These images will help educate septic system users on what should not go down the toilet. 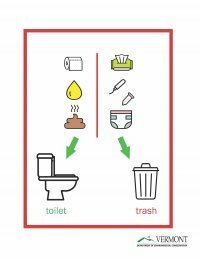 If you own a home, camp or business that is visited by guests that do not understand that wastewater systems are not designed to handle so called ‘flushable’ wipes, paper towels, diapers and personal hygiene products, these signs will convey a clear message on what goes in the toilet and what goes in the trash. Grahame Bradley, PhD, Hydrogeologist & Soil Geologist from the Drinking Water & Groundwater Protection Division of the Department of Environmental Conservation along with Gunner McCain from McCain Consulting were interviewed to bring awareness to the importance of sewer maintenance for Septic Smart Week. The video is located on the WCAX website. Follow Steve Pro, Licensed Designer and owner of The Septic Pro from the kitchen sink to the wastewater drainfield. Along the way, Steve provides valuable Septic Smart messages and information that all owners of on-site septic system should know. This video is located on the ORCA site. Village Wastewater Solutions: A new interagency initiative assists communities in finding viable wastewater and drinking water solutions to help stimulate opportunities and reinvestment in our small towns. Find tools, resources and contact information on the Village Wastewater Solutions page. Each line below is a link to information about that topic. How do I test my private well? What is a wastewater system?